A sharp cheese, green pepper, and garlic make a terrific stuffing. This is a great one-dish meal and a pretty one as well. Preheat oven at 355F (180C). Season cavity of the chicken with salt, pepper, and oregano. Add garlic, cheese, and pepper chunks. 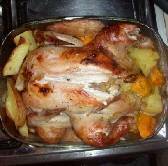 Place in a roasting pan. Season potatoes, place around the chicken, and sprinkle with oregano. Pour olive oil and lemon juice over the food. Add water to the pan in one corner (not on food). 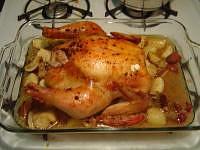 Cook at 355F (180C) for approximately 1 hour 40 minutes.